Jim poses for a picture with his dog, Henry. Have you ever lost a favorite shoe or TV remote control as a result of inappropriate chewing behavior on the part of your canine best friend? When Henry, my now two-year-old Jack Russell, was a puppy, I lost the corners on two baseboards in my almost-new house! The incident was, of course, not Henry’s fault. He was a puppy and puppies chew! Had I not given him the opportunity, my baseboards would have remained intact and I wouldn’t have had some “splainin’” to do when my wife got home. Chewing is a perfectly natural behavior, especially amongst puppies and dogs of certain breeds. It is up to us humans to teach our best friends the difference between our Italian loafers and PetSafe® Busy Buddy® toys! For dogs who find themselves in an animal shelter environment, it is even more important that we give them an outlet for that need to chew. In a recent blog post, Dr. Emily Weiss of the American Society for the Prevention of Cruelty to Animals (ASPCA) explained the critical importance of chewing for dogs in shelters. 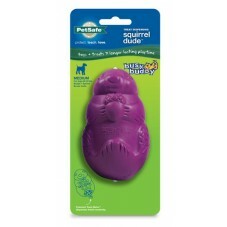 The Busy Buddy Squirrel Dude is a great toy for strong chewers! Many organizations are doing a great job of enriching the kennel environment with toys and treats. The PetSafe Brand is helping select shelters do just that. Through the PetSafe Shelter Enrichment Project we are providing partner shelters with enough Busy Buddy® Squirrel Dude™ toys to ensure that there is a toy in every kennel in the facility at all times! Not only do these interactive, treat-dispensing toys help reduce anxiety by keeping dogs busy and engaged, but studies have shown that simply having toys in kennels increases adoption rates! Maybe potential adopters are able to better relate to dogs with toys and see them as potential pets? Whatever the case, we know that offering toys to shelter dogs is a good thing all the way around and PetSafe is happy to be able to help. Dogs agree, Lickety Stik is doggie delicious! And, in addition to toys, partners in the PetSafe Shelter Enrichment Project are provided with Lickety Stik® liquid pet treat for all dogs and cats in their adoption centers. Lickety Stiks follow these animals during their stay in the shelter so that staff and volunteers can reward positive behaviors. And, when the pet is adopted, the Lickety Stik goes home with them! The PetSafe Shelter Enrichment Project is still a relatively new program and it continues to grow and develop. As of this writing we have partnerships with 5 animal welfare organizations across the US with plans to add at least 5 more in 2014. And, for those organizations who don’t quite make it to the partner list, PetSafe offers extremely low pricing so they may purchase toys, treats and other products at a discount. Our tagline here at PetSafe is “Protect. Teach. Love.™” and we live up to it each and every day. We are proud to partner with so many fine animal shelters who work hard to make their communities better for animals and people alike.